Being the most specified extruded aluminum walkway cover manufacturer in the nation today didn't come easy. It started in 1950 when the company was founded by Walt Dittmer, Sr. Walt, of German ancestry, arrived in the United States in 1925. After a few years in New York, he moved his family and German qualities to Central Florida. In 1957 he was joined in business by his two sons, Walt, Jr. and Ted. 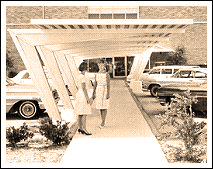 The company at that time manufactured and installed a variety of canvas awnings and associated products. After the death of Walt, Sr. in 1966, his oldest son Walt, Jr. stepped forward to continue and improve the current business. In 1961, Walt Dittmer, Jr., developed an internal draining, interlocking extruded aluminum deck system. This deck system would be unlike it's roll-formed counterpart. It would be extruded with a minimum .060 wall thickness and withstand hurricane winds, hail and being walked upon. It would fasten onto heli-arc welded tubular frames and drain internally through common weepholes at the column's base. This system became the product of choice for a local architect who wanted to specify the Dittmer system, but insisted that he needed a model name. With time becoming short, the architect finally said " I don't care if you call it Ditt-Deck!" and thus the name was born. As the extruded walkway cover industry began to prosper, so did the need for fabrication room. In 1971 the company purchased an 8,000 square foot building 20 miles north of Orlando in Winter Springs. The original building has been expanded three times to the now 30,000 square foot facility. The outside showcases many of our specialty products from louver systems, overhead canopies, carports, aluminum and acrylic walkway covers to artistic sculpture. The inside is a highly efficient facility and houses extrusions from over 200 custom designed dies. Through the years we have evolved from pencil drawings to CAD generated drawings utilizing the latest AutoCad drafting technology. The Dittmer team remains the leader in providing innovative and quality aluminum structures throughout the world. In your travels you can see over 4,000 Ditt-Deck and Ditt-Dome projects from Alaska to Africa to Hawaii to Russia. With our specially design trucks and trailers, delivery and installation is not a problem. Along with our factory trained crews, D.A.A. holds a Specialty Structure contractors license and guarantees a quality product and workmanship throughout every aspect of the project. It continues today, to be a family owned business, dedicated to preserving the reputation for quality and its position as the leader in the industry. Walt Jr. and his wife, Martha continue to participate part time. His son, Dana Callan, is at the helm as president after 30 plus years of working his way up through every position. He is joined by his wife, Karen and sister, Shelli and a team of experienced professionals most of whom have over 25 years with the company. 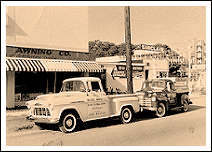 We celebrate our history and longevity and continue to strive to remain the leader in all types of specialty aluminum structures. We look forward to making your visions a reality now and in the future.